The Ministry of Foreign Affairs & International Trade through the Presidential Circular No. 1/2007 is charged with the responsibility of dealing with the Diaspora and International jobs. 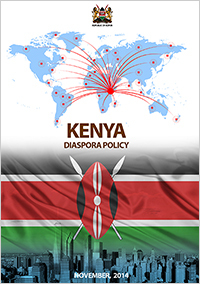 To serve Kenyan nationals abroad through the provision of efficient and effective Consular services. To facilitate the placement of Kenyan nationals in international jobs and harness the skills and resources of Kenyans in the Diaspora. To design programmes that would integrate the Diaspora into national development. To enhance partnerships with the Diaspora and secure more international jobs for Kenyans by ensuring that Kenya lobbies for those jobs and enters into bilateral arrangements that guarantee an increase in the number of Kenyans employed internationally. To improve the delivery of Consular services and develop Diaspora specific products to enhance partnerships with the Diaspora.